The classy Cali-born burger bar touches down in Wicker Park. When I first decided to make the trip to Umami Burger, I just wanted to put my California friends’ raving about “the best burger place EVER” to rest. But from the moment I walked in, it was clear that maybe they were onto something. I sat down at my table and looked over the menu as my cheerful waiter explained the concept of umami (the fifth flavor) and how Umami Burger tries to incorporate it into each of their dishes. With intriguing names like Sloppy Mami and the Manly Burger, the dishes were already getting me pumped. I ordered The Original, a burger made with a blend of hand-ground beef, house-made ketchup, shiitake mushrooms, roasted tomatoes, caramelized onions and crisped Parmesan cheese. It seemed like a pretty delicious burger when I read through these ingredients on the menu, but no amount of appealing descriptors could prepare me for the savory tsunami that was about to flood my tastebuds. After a short wait, my burger arrived at my table, all the components stacked on top of the beef and a brioche bun branded with the signature “U”. As I took the first bite, I was overwhelmed (in the best way possible) by the combination of roasted vegetables, garlic-soy infused ketchup and the hearty flavor of the beef. I’m not going to lie, I slipped into a weird state of post-deliciousness euphoria where I couldn’t stop smiling (I’m sane, I promise). By the first bite, I knew that this was unquestionably the best burger I had ever tasted. 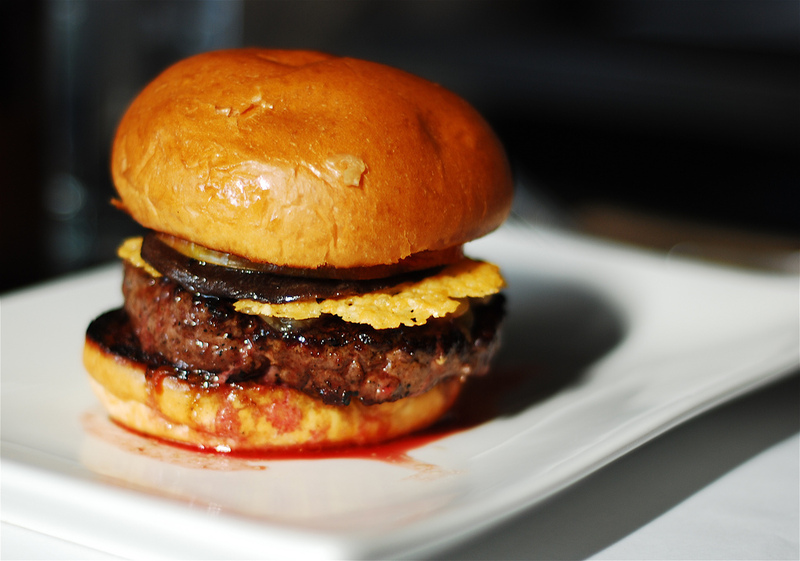 In addition to traditional beef burgers, Umami Burger offers multiple other options for specific diets. Vegetarian? Get your burger with a portobello mushroom instead of beef. Gluten-free? There are salads on the menu, and if you’re still craving a burger, they’ll replace your buns with lettuce. If you just aren’t a big fan of red meat, you can enjoy burgers like the ahi tuna burger or the Greenbird, a turkey burger served with avocado, lettuce and herbed cheese. Overall, Umami Burger pretty much crushes the competition. The prices are definitely a bit higher than your average burger joint (the burgers range from $12 to $15), but it is beyond worth it. I never thought I would renounce my allegiance to Five Guys, but once I tasted this burger there was no going back.